Mirabad district, 3, Movarounnakhr Str. 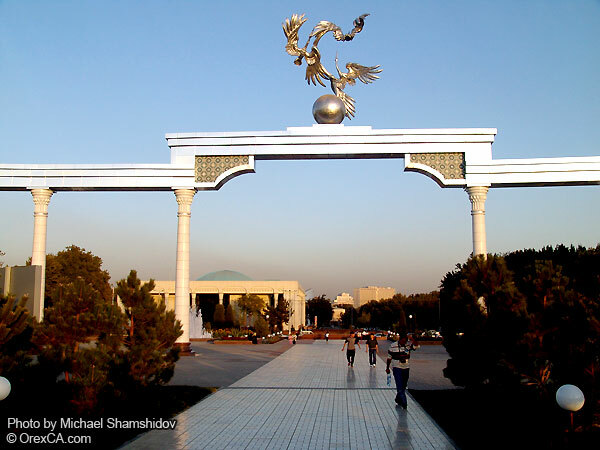 Tashkent is the capital of Uzbekistan, Uzbekistan's largest city (population 2,400,000) is also Central Asia's largest city and its main transportation hub. At present, Tashkent is one of the most important business centers in Central Asia. Present-day Tashkent is one of the most beautiful cities in Asia, and its architecture is unique; the hospitality and friendliness of Tashkent people is amazing. The city is more than 2200 years old, and has evolved from a small ancient settlement to the one of the largest metropolitan areas in the region. Many remarkable events, both in peace and war, have taken place during the history of Tashkent, including many periods of rise and decline. The city is host to Embassies and consulates of many countries of the world, and is known among travelers as a great place to stay and arrange visa and trips throughout the region; Tashkent lies right on the border with Kazakhstan and also is known as the main "gates of the Orient" on international air routes from India, Afghanistan, Pakistan, and China to Europe. The Tashkent Metro, currently the only subway in Central Asia, is fantastically designed in a unique, monumental Uzbek-Soviet style. It is never crowded, and the easiest and cheapest way to quickly transit the city. Tashkent is simply bursting with interesting museums, ancient historical sites, lush parks, and a diverse selection of high-quality restaurants, nightclubs and shops. The city of Tashkent is located within Tashkent Region, which lies in the far northeastern corner of Uzbekistan, near the border with Kazakhstan and Kyrgyzstan. Its area covers 15,300 sq km; 10% percent of the total population of Uzbekistan lives in the Tashkent Region. The majority are Uzbeks, but more than 90 other nationalities also live here, primarily Russians, Kazakhs, Tajiks, Kyrgyz, and ethnic Koreans. The average population density is more than 146 persons per sq. km. The Tashkent Region consists of 15 districts, 16 towns, 17 settlement, and 147 kishlak (villages) councils. It is situated between the western slopes of the Tien Shan Mountains and the Syrdarya river. The Tashkent Region ranks second in Uzbekistan in industrial development. Over 260 enterprises representing 160 industrial branches produce twenty percent of the country's gross output. Principal industries are power generation, mechanical engineering, metallurgy, chemicals, textiles, footwear, and cotton processing and agricultural production. 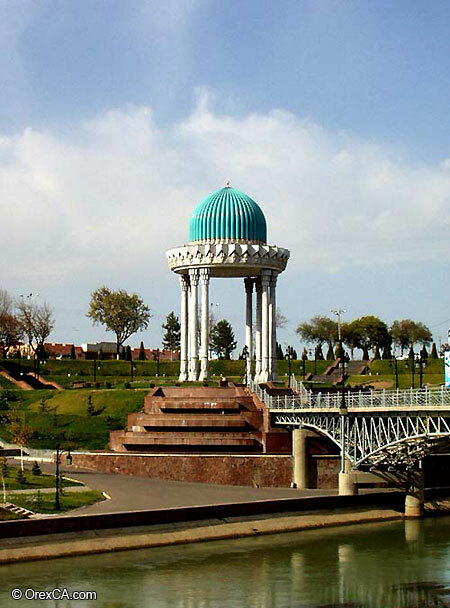 Tashkent is a city which is famous for its exceptionally valuable architectural heritage. There are many interesting monuments which have been preserved from the Middle Ages; buildings of 19th c. erected by the architects such as A. Benoua, V. Gueintselman and A. Makarov according to European traditions; imposing Soviet era administative and apartment structures; and modern buildings which combine the latest architectural achievements with national style, local picturesque decore and Asian architectural traditions. The most important monuments date back to the 16th c., the "golden age" of the city's history. Among these are: the Kukeldash Madrassah, the Barak-Khan Madrassah complex, the Suyunige-Khan and Khaffal Shashi Mausoleums, and the Yunus-Khan and Kaldyrgach-Biya Mausoleums. Among the buildings of the late 19th c. - early 20th c. is the Palace of Grand Duke Nickolas Konstantinovich Romanov, Girls' and Boys' Schools, the Technical High School and the Government Building, the Kirche. The Chorsu Tourist Complex, the Istiqlol Palace, the Exhibition Hall of the Union of Artists of Uzbekistan, and the lavishly decorated Tashkent metro stations are among the modern landmarks of the city. The Tashkent fountains, an intricate element of its architectural style, add to the uniqueness of the city. The residents of Tashkent are especially proud of the Alisher Navoi Opera and Ballet Theatre. It has become famous because of such outstanding performers as Tamara Khanum, Bernara Karieva, Mukhtar Ashrafi. 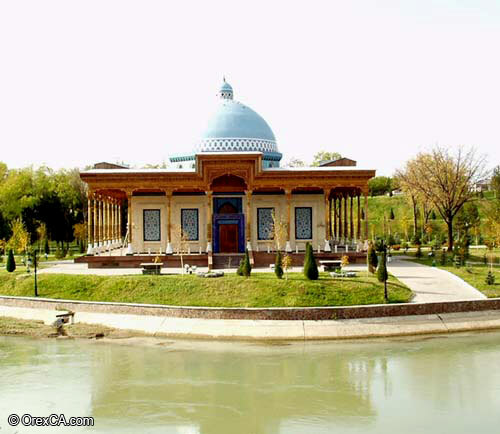 Zangi-Ata's mausoleum was constructed by Amir Temur in 1397. It is the oldest surviving example of a Timurid structure in Tashkent. Also at the complex are a madrasah, a cemetery and a smaller mausoleum to Zangi-Ata's wife and mother in law, the Anbar Ona Bibi mausoleum. For Central Asian Moslems, Zangi-Ata is one of three destinations for their Hadj, or life's pilgrimage. The most devout Moslems will first make a trip to Zangi-Ata; next to Ahmad Yassavy mausoleum in Kazakhstan; and finally, to Mecca. Its popularity and importance at some times has turned Zangi-Ata into a carnival with its own amusements - sometimes providing plov, tea, fortune tellers and even dervishes. Today, though, the complex is a quiet spot for prayer and Islamic studies.